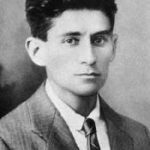 Franz Kafka was born into a middle-class, German-speaking Jewish family on July 3, 1883 in Prague, Bohemia, now the Czech Republic. Franz was the eldest of six children. He had two younger brothers who died in infancy and three younger sisters (Gabriele (1889–1941), Valerie (1890–1942), Ottilie (1892–1943), all of whom perished in concentration camps. His father, Hermann Kafka (1852–1931), was described as a huge ill-tempered domestic tyrant, who on many occasions directed his anger towards his son and was disrespectful towards his escape into literature. Kafka's father was a businessman who established himself as an independent retailer of men's and women's fancy goods and accessories, employing up to 15 people. All his life Kafka struggled to come to terms with his domineering father. Kafka's mother, Julie (1856—1934), was the daughter of a prosperous brewer and was better educated than her husband. She helped to manage her husband's business and worked in it as much as 12 hours a day. The children were largely raised by a series of governesses and servants. From 1889 to 1893, Franz attended the Deutsche Knabenschule, the boys elementary school in Prague. He was sent to German schools, not Czech, which demonstrates his father's desire for social advancement. His Jewish upbringing was limited mostly to his bar mitzvah and going to the synagogue four times a year with his father, which didn't give him much to go on. In 1901 he graduated from the Altstädter Gymnasium, the rigorous classics-oriented secondary school with eight grade levels. He did well in school, taking classes like Latin, Greek and history. After secondary school he went on to Charles Ferdinand University, where at first he decided to study chemistry, but switched after two weeks to law. In the end of his first year, he met another student a year younger than he was, Max Brod, who would become a close friend of his throughout his life, together with the journalist Felix Weltsch, who also studied law. Kafka obtained the degree of Doctor of Law on June 18, 1906 and performed an obligatory year of unpaid service as law clerk for the civil and criminal courts. At the end of 1907 Kafka started working in a huge Italian insurance company, where he stayed for nearly a year. His correspondence during that period witnesses that he was unhappy with his working time schedule - from 8 p.m (20:00) until 6 a.m (06:00) - as it made it extremely difficult for him to concentrate on his writing. On July 15, 1908, he resigned, and few weeks later found more suitable employment with the Worker's Accident Insurance Institute for the Kingdom of Bohemia. He worked there until July 1922 when he retired for reasons of ill health. He often referred to his job as insurance officer as a "bread job", a job done only to pay the bills. However, he did not show any signs of indifference towards his job, as the several promotions that he received during his career prove that he was a hardworking employee. In parallel, Kafka was also committed to his literary work. In 1912, at the home of his lifelong friend Max Brod, Kafka met Felice Bauer, who lived in Berlin. Over the next five years they corresponded a great deal, met occasionally, and twice were engaged to be married. Their relationship finally ended in 1917. In 1917, Kafka began to suffer from tuberculosis, which would require frequent convalescence during which he was supported by his family, most notably his sister Ottla. In the early 1920s he developed an intense relationship with Czech journalist and writer Milena Jesenská. In 1923, he briefly moved to Berlin in the hope of distancing himself from his family's influence to concentrate on his writing. In Berlin, he lived with Dora Diamant, a 25-year-old kindergarten teacher from an orthodox Jewish family, who was independent enough to have escaped her past in the ghetto. Dora became his lover, and influenced Kafka's interest in the Talmud - a book of Jewish law. It is generally agreed that Kafka suffered from clinical depression and social anxiety throughout his entire life. He also suffered from migraines, insomnia, constipation, boils, and other ailments, all usually brought on by excessive stresses and strains. He attempted to counteract all of this by a regimen of naturopathic treatments, such as a vegetarian diet and the consumption of large quantities of unpasteurized milk. Despite all that, his tuberculosis worsened; he returned to Prague, then went to Dr. Hoffmann sanatorium for treatment, where he died on June 3, 1924. His remains are buried alongside his parent's under a two-meter obelisk in Prague's New Jewish Cemetery in Olsanske.